I was glad I spoke to Kadija recently. She is a 25 years young single attractively woman, working for the past 4 years as a corporate lady earning a decent income of 5k a month. Not only she is intelligence, she is a very kind person who loves her parents greatly. Ever since she completed her university education and took this job four years ago, she had never pocketed her salary herself. The first month when she drew her pay, she went straight to both her parents and gave her entire earned income to them. She felt that her income should be given to her ageing parents. She remembered when she was young, it was the parents who took care of her. From the day she went to the nursery class till her final year at the university, it was the parents who were responsible to her financial. Though the father was not rich, he never failed to give what she wanted at those younger days of her life. Sometime father had to borrow to provide her for the needed fund on her education then. He paid and gave those cash willingly to her loved darling daughter of the house. Now that Kadija is a grown up lady, she felt it is her full responsibility to repay her kindness to both her great parents. Each time when she drew her salary, she will cash out the exact pay from her ATM bank and would be proud and happy to handover this cash to both father and mother at home. In turn parents would give her $10 per day for her to go to work everyday. In case if she needs extra cash urgently, she would then ask her parents again. She promised that even if she gets marry one day and is still working, she will continue to give her income to her parents till the day when both are not in this world. Giving her earned income every month to her parents is a joy and happiness for Kadija. A rare breed and practice you hardly could find today. I cried while listening from my dear friend. Because I remembered when I was young and when I took my first job at the age of 18, I also gave my entire salary of only $138 to my mother who was still alive then. It was not in my mind that salary earned should be kept by me. A son's duty is to earn as much as he could, and gives all his income to the parents instead. My mother cried with tears when I gave my first payroll to her. I asked mum why you cry! She said my son is now a grown up child and mum cried because I know my son loves me. I could only give three years of my salary to mother, because three years later she left the world. The world has changed. I wonder how many children of today could be like Kadija. 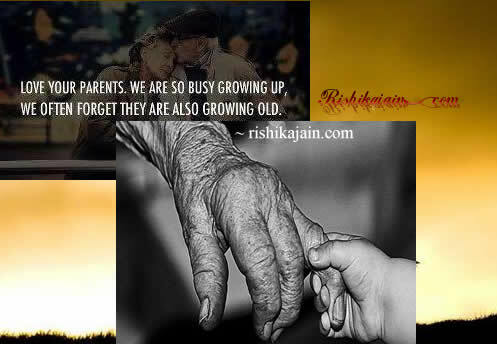 Food for thought - Love Your Parents . We are so busy growing up, we often forget they are also growing old. Thnx a lot for posting this, really touched me. I hope youngster out there will be applying the same, thou time had changed but Atleast a portion to make them feel happy. You are simply treasured in my heart. You are my admirable friend as well. Please stay in touch.